Sunday Mail wrote: According to legend, Arthur and Guinevere were supposed to have been buried on the Islland of Avalon on the Somerset marshes around 542. Hugh McArthur wrote: He was related to St Columba and St Kentigern and was the son Aeden MacGabhrain, a sixth century King of Dalriada (Argyle and Ulster) whose mother was from the British Kingdom of Strathclyde. Artur MacAeden became a King of the Britons. He had a fortressat Dumbarton and was buried in Govan. Hugh believes the great King is buried at Govan Old Parish Church. Many people believe an ancient stone coffin holds the body of St Copnstantine, the founder of Govan and one of the first to introduce Christianity to Scotland. But Hugh says it hold the remains of Arthur. He is particularly intrigued by the Celtic warrior carving on the side of the coffin engraved with the letter A. The Old Parish Church was used as a burial site for the Castle at Dumbarton , whose ancient name was Castello Arturius-Arthurs Castle. ...And its not just Arthur- many of the characters in the stories can also be linked to Artur MacAeden and Scotland. Loch Lomond used to be known as The Lake. Guinevere's grave is at Meigle, Perthshire. Myrddin- or Merlin featured in the life of St Kentigern. Like the Arthur of legend, the Scottish Artur had a sister called Morgana. Slightly related the there was a "St Constantines" church on a hill on our farm (in Galloway, near Crocketford for those that know it) ...nothing remains at all, but you can see where it was. Intermittently over the years people have dug up....lead, presumably from the roof. I want a metal detector. Remember we sat down and designed a HG.COM metal detector ? With advanced phase compensated discriminator circuit!! ? Why did we never build it again ? Excellent question TZ, I can only assume that we forgot. I understand that some of the most ancient standing (or burial?) stones found in Britain are in the Govan Old Parish graveyard. Isn't there also something peculiar about the location of Govan and the old pre-history ley lines? Was Merlin a Weegie ? The legendary wizard Merlin has been added to a list of famous Glaswegians, it has emerged. The council included the wizard, who featured in Arthurian legend, on a list of well-known figures from the city. 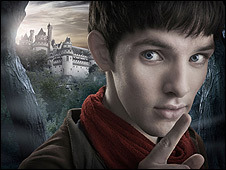 A council spokeswoman admitted that like most mythical figures, it was difficult to trace Merlin's origins. But she said the wizard had been added to its website list after an amateur historian suggested Merlin had lived in the Partick area of the city.